Among artists, choreographers have it pretty tough—their art requires not just space, but people. 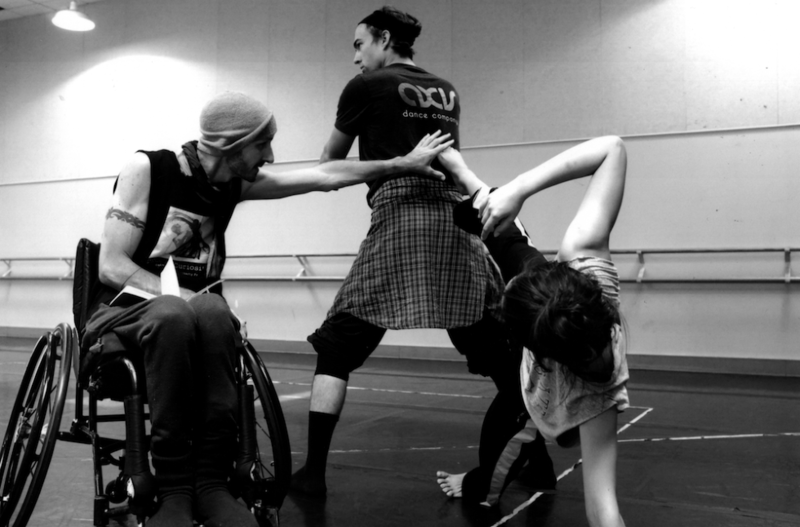 For disabled choreographers, those requirements can be even harder to meet. Is the (probably expensive) space accessible? Do they have access to dancers, disabled or not? Can they afford to pay them? In June, with support from the Andrew W. Mellon Foundation, AXIS Dance Company gave a group of disabled choreographers the gift of time, space and dancers in a weeklong program called Choreo-Lab. Spearheaded by artistic director Marc Brew, who served as a mentor along with co-facilitator Caroline Bowditch, the inaugural Choreo-Lab included seven choreographers and a physically integrated cast of 20 dancers. DT: What's unique about Choreo-Lab? Marc Brew: It was developed by a disabled choreographer, and it was disabled-led. Caroline and I would work with the choreographers each day to share experiences and challenges and problems and find solutions together, and this was extremely fruitful. Also, it's pretty rare for choreographers to be able to observe each others' processes. In addition, we brought guest teachers in to introduce them to integrated dance. MB: I keep getting told I'm very ambitious. I threw everything into this. Some challenges were just in the way we had to manage our three studio spaces; choreographers had to share space each day. Also, right away we heard that dancers wanted more time with the choreographers all together. But the focus was on the choreographers, which I had to keep reminding the dancers. Another challenge was that the choreographers all had different levels of experience. Some had never choreographed on nondisabled dancers, which was a learning curve. DT: What does the future of Choreo-Lab look like? MB: I would streamline it a bit more, with only four choreographers, and provide more time for peer-to-peer learning, with choreographers shadowing each other, as well as working. I would extend the program from 6 days to 12. I learned it could be good to offer one-on-one time for the choreographers with AXIS staff to talk about business needs and practices. This year, we didn't plan ongoing mentorship, and each of the choreographers asked for it. Caroline and I have offered to volunteer our time to do this. The work-sharing at the end was more important than I even thought, since the program was focused on process. I was wondering why that was, and on reflection, there's such a lack of opportunity to create work. Since we invited guests to the showing—potential presenters and funders—all the choreographers ended up putting something together to perform and show, to take advantage of that opportunity. DT: What particularly inspired you during the week? MB: Each choreographer finding their way in, their way of connecting with the dancers to get their vision and idea across. Seeing and witnessing those connections, with the choreographer getting their idea through to the dancers, was inspiring—those breakthrough moments. It got quite emotional for some choreographers, when they got to share their process with the audience. One of them started crying, because there they were watching their work. Their idea became a reality. As dance teachers, we're always looking for new treats to hand out to our littles at the end of class. Rewards for good behavior can be a lifesaver when dealing with rambunctious up-and-coming dancers, but if they get too predictable, the candies can lose their persuasive effect. Thank goodness for seasonal trends in treats—they give us just the shakeup we need! Since Easter is coming up fast, we thought we would share with you five different candy ideas to hand out this month. They're the break from lollipops that you've been looking for!